Primary open-angle glaucoma (POAG) is an optic nerve disease with elevated IOP as the main risk factor. In recent years, with the development of interdisciplinary in the ophthalmology and neurology, new questions about the essence of POAG have been raised. Is POAG just an ocular disease? Is it a disease which involves the eye first and then the whole visual pathway? Or sometimes is it an ocular manifestation of a particular central nervous system (CNS) disease? Recent experimental and clinical studies have suggested that POAG patients may have an abnormally low cerebrospinal fluid pressure (CSFP). It was thought that trans-lamina cribrosa pressure difference (TLPD) may be associated with pathogenesis of POAG, instead of either IOP or CSFP alone. These questions have caused controversy in the field of ophthalmology. Previous studies showed that POAG does not only involve the optic nerve damage but also affects the lateral geniculate body, the optic radiation, and the visual cortex. It is a multilevel syndrome throughout the visual pathway. 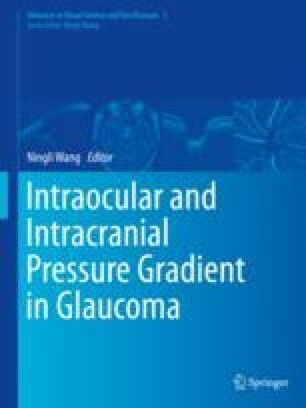 The mechanism of glaucomatous lesion is complex, which involves transsynaptic damage, blood supply disorder of the visual pathway, and blood-brain barrier abnormalities. It was hypothesized that glaucoma might be recognized as a CNS disease.